Open Source Religion | Belief System Framework | A framework for belief system development. Open Source Religion is a theoretical belief system development framework in which belief systems are adopted, deleted, edited, or even created by power of Belief Module theory. Belief Modularity is the understanding that beliefs may be adopted from all sources, edited by the right information, or deleted when in disservice to your core values. In this system beliefs are treated as building blocks with parent and child beliefs attached to them. Open Source Religion supports all beliefs and no beliefs. It should operate as a framework, as transparent as possible, and existing solely to provide users with better decision making. Belief systems may be changed at any time, given appropriate new information or experiences. Editing takes place using the benefits of Belief Modularity. All belief systems are created by networks of belief modules. Beliefs may be adopted from any source, religious and non-religious. Beliefs may be adopted, edited, or deleted when presented with the right information. Beliefs have parent/child relationships to one another. Open Source Religion is a method in which belief systems find more truth and alignment with the user because of the ever evolving nature of OSR, and thus the ability for OSR based belief systems to constantly adjust to the user’s needs. More important than it may sound. An open framework means that a single belief system may house beliefs from across religions (eg: salvation and karma). It is important to adopt Belief Modularity because when an authority figure makes a mistake, millions can adopt it. By remaining flexible, you can remain true to your truth, your Christianity, your Atheism, your anything. By open sourcing your religion you are better equipped to fight for the integrity and preservation of your religion. Belief systems both religious and non-religious may be designed and used. 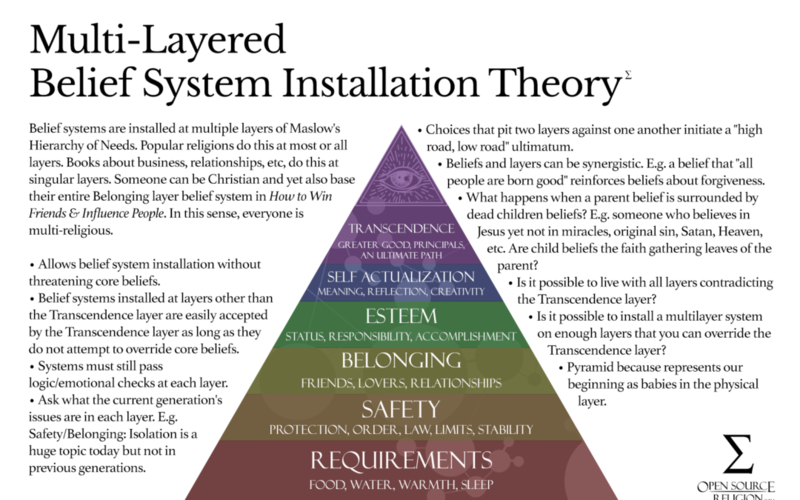 They may even be designed for specific purposes or facets of a person’s life as can be seen in the Multi-Layered Belief System Installation guide. The Idea That People Edit Their Own Belief Systems Is Nothing New. True, even Thomas Jefferson heavily and famously edited his Bible 200 years ago. The Ideas In OSR Are Obvious, Everyday Knowledge. Some people know and utilize the ideas expressed here without ever knowing about Open Source Religion, this is true. However most people probably do not know about these principals, and for many people the ideas that we have such freedom of choice in our beliefs and can even purposefully create belief systems are very useful and can even change lives. Skateboarders are capable of amazing maneuvers. And even though almost anyone is capable of learning and executing these maneuvers, 99% of us would never know it was an option until we were shown or told we could. Self help books have told people things they could have discovered themselves for hundreds of years, but they are valuable because no single person can think of everything. Why is Open Source Religion Important? Open Source Religion provides an opportunity to clarify, organize, and evolve the natural human habit of culminating beliefs inside and outside a religious context. We’ve spent centuries cataloging people, in primarily about a dozen popular labels (Christian, Muslim, Buddhist, Atheist, Agnostic, Jewish, Wiccan, Spiritual, etc), all the while ignoring the far more accurate fact that people’s belief systems are customized, especially when you take into account non-religious beliefs. This is a gross oversight of one the most important aspects of the human experience – the very way we individually experience life. We even see this trend within Proprietary Religions themselves. Saying someone is a Christian these days is like saying a dog is just a dog and neglecting the fact that there are thousands of breeds with different temperaments and builds. At some distant time in history perhaps anyone called “Christian” truly believed 99% the same things as the next Christian. That time has passed, and that level of homogeneity may never be seen again. It is through this lens that you will begin to see how OSR has been evolving through time and how far it has come. Empathy is perhaps one of the only binding human experiences based in emotion that can bring two very different people together. When you approach someone from the perspective of OSR; you stop seeing them as someone who just is some stereotypical amalgamation of their labels and you start seeing them as someone who has chosen, like you, a unique compilation of Belief Modules for very personal reasons. It’s very difficult not to have understanding and empathy for someone once you see this. With Open Source Religion you don’t need to change what you believe, you need only to believe that you can change. If religions were represented by colors, Open Source Religion would be transparent. A community of Open Source Religion users helps you to self reflect on your belief system, module by module. Which modules create separation? Which create empathy? Which could be edited? Which contradict one another? Which create negativity? It gives religious and non-religious people a single common ground on which to communicate. Open Source Religion is the future of religion because its adoption has already come to pass. Billions today practice the art of OSR and will continue to interact with belief in ever more unique ways; we will continue to forge new religions, and the grindstone of time will continue to cleave new facets into the spiritual experience, giving old gems interesting new reflections. The use of OSR is old, but addressing and utilizing it is quite new. Jefferson Bible: http://en.wikipedia.org/wiki/Jefferson_Bible Considered blasphemous by most people at the time. Jefferson felt that the current homogenous “bubble” of Christianity did not suit his own beliefs. In religious heterogeneity you’ll notice a number of different abilities added to your spiritual toolbox such as belief adoption, belief evolution, cross-religious adoption, and in the case of Jefferson, deletion. Without the Open Source Religion approach, Jefferson would be confined only to the beliefs presented to him, no more no less. This are articles dedicated to theoretical ideas and systems based on Open Source Religion principles stated in the Open Source Religion Manifesto.